It's hard to believe that a single material can be described by as many superlatives as graphene can. Since its discovery in 2004, scientists have found that the lacy, honeycomb-like sheet of carbon atoms - essentially the most microscopic shaving of pencil lead you can imagine - is not just the thinnest material known in the world, but also incredibly light and flexible, hundreds of times stronger than steel, and more electrically conductive than copper. Researchers in the past, including this team, have been able to synthesize graphene superconductors by placing the material in contact with other superconducting metals - an arrangement that allows graphene to inherit some superconducting behaviors. This time around, the team found a way to make graphene superconduct on its own, demonstrating that superconductivity can be an intrinsic quality in the purely carbon-based material. The physicists accomplished this by creating a "superlattice" of two graphene sheets stacked together - not precisely on top of each other, but rotated ever so slightly, at a "magic angle" of 1.1 degrees. 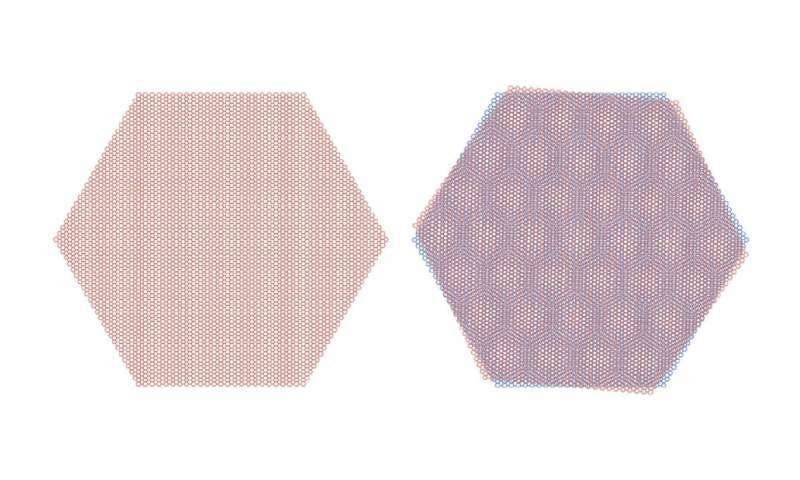 As a result, the overlaying, hexagonal honeycomb pattern is offset slightly, creating a precise moiré configuration that is predicted to induce strange, "strongly correlated interactions" between the electrons in the graphene sheets. In any other stacked configuration, graphene prefers to remain distinct, interacting very little, electronically or otherwise, with its neighboring layers. At 1.1 degrees - a rotation that has been predicted to be a "magic angle" - the researchers found the graphene superlattice electronically resembled a flat band structure, similar to a Mott insulator, in which all electrons carry the same energy regardless of their momentum. For electrons, this means that, even if they are occupying a half-filled energy band, one electron does not have any more energy than any other electron, to enable it to move around in that band. Therefore, even though such a half-filled band structure should act like a conductor, it instead behaves as an insulator - and more precisely, a Mott insulator. To find out, they applied a small gate voltage to the "magic-angle graphene superlattice," adding small amounts of electrons to the structure. As a result, individual electrons bound together with other electrons in graphene, allowing them to flow where before they could not. Throughout, the researchers continued to measure the electrical resistance of the material, and found that when they added a certain, small amount of electrons, the electrical current flowed without dissipating energy - just like a superconductor.